D'Addario EXP Coated Phosphor Bronze Acoustic Bass Guitar strings have a built-in barrier against corrosion and wear that can quickly kill the life of your strings and the sound of your acoustic bass guitar. 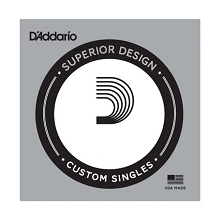 D'Addario EXP Coated Strings have a natural round wound feel and maintain extra-bright tones that last up to four times longer than traditional bass strings. Long Scale: Fits most 34" scale instruments that accommodate a 37.1" winding from Ball to Taper.